For this day after Valentine’s Day, we’re not talking chocolate or sweets. 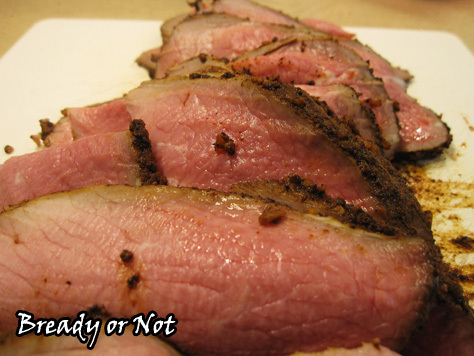 Instead, let’s go straight for a big chunk of meat: using a chili and coffee rub to make sliced roast beef! I was pretty intimidated the first time I tried a basic recipe for this dish. 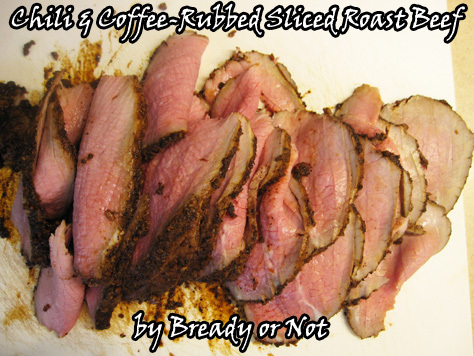 It didn’t help that it made way too much rub, which I tried to use up anyway, which meant the roast started smoldering like a log when it started cooking. Whoops. Despite the hassles, my husband loved the end result, so I resolved to re-do the recipe and get it right. I think my husband’s feedback on each iteration was just a big hint to keep making these roasts. He likes these served up as sliders. On a piece of aluminum foil, I use my dinner rolls, add a piece or two of meat, a dollop of coarse mustard, and a sprinkling of shredded cheese. I close the rolls and pour some melted butter on top, wrap the sliders in the foil, then bake until the cheese is melted. Perfection. I think this roast beef has spoiled us. 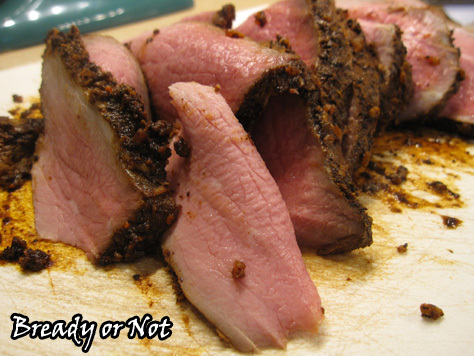 This recipe gives you the freshest meat possible, and if you catch eye of round roasts on sale, whoa is this a bargain! A Bready or Not Original! 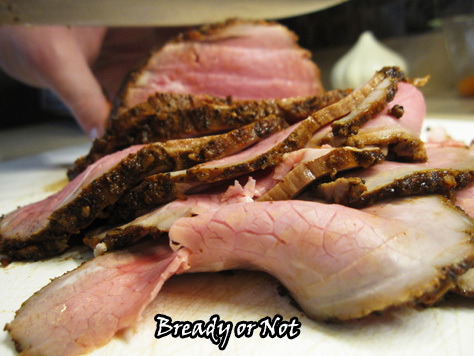 Use an eye of round roast to easily make the best roast beef sandwiches you’ve had in your life. Move your middle oven rack down a slot to be near the bottom and preheat oven to 475-degrees. Use a small roasting pan, or prepare a rimmed cookie sheet with aluminum foil and place a rack on top of it. Apply nonstick spray. Combine the first seven ingredients in a small bowl. If the rub is too thick, add a touch more orange juice or water. Spread the mixture all over the roast. Bake meat for 12 minutes, then turn it over and bake for another 12 minutes. It may start smoking because of the thick seasoning on the meat; if so, turn on the vent and keep an eye on things. Without opening the oven, reduce heat to 300-degrees. 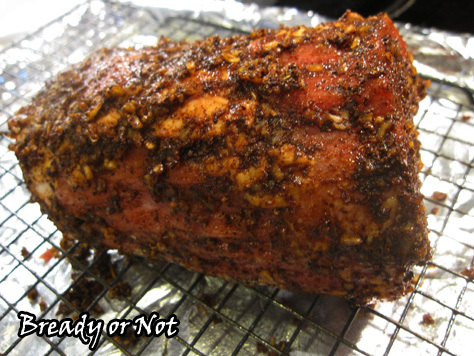 Roast for another 30 minutes, or until a thermometer registers 120-degrees in the center. Let the meat rest at room temperature for 30 minutes. Don't remove the crusted seasonings. Wrap the roast in parchment paper and then encase in plastic wrap. Refrigerate it for 8 hours or overnight. Serve the meat by cutting it into thin slices. Serve in hot or cold sandwiches, wraps, on crackers, or eat straight out of hand.